As soon as we began to chronicle our involvement with The Food Stamp Challenge, Living on $42.00 per Week,* a series we initiated nearly three years ago, we got our readers’ attention—lots of it. Yes, it’s hard to believe we did that before most of us thought we’d see the Obama family in the White House. And we’re really glad they’re there, especially since Michelle Obama has put herself in the front-lines with her campaign to reverse the American epidemic of childhood obesity. To lend our support to Mrs. Obama and a cause we also support, we’ve aggregated posts that were part of our good-food-on-a-budget series. Our own observations as well as our philosophy on the cooking—and sharing—of a week’s worth of food-for-thought is now here, accessible via a single cyber-link. With all of our posts about spending a week “on food stamps” here in one spot, you can now move more easily from one post to the next—or back-track to a particular recipe. We’re gratified that so many have told us they value our exploration of such topics. And we hope that by providing a convenient link to all of them, the ideas we discuss will gain wider circulation. * As of November 1, 2009, the Federal Food Stamp budget for one person is now $25, slightly higher than the $21 allotted when we undertook the challenge in 2007. You may have noticed that we haven’t been posting for a couple of weeks. What began as a glitch with one of our Websites escalated to become a calamity for all of them, causing us to leave our former hosting service and sign on with a new one (thanks to a very practical referral from our new friend, Skip Dyrda). But we’ve put all the pieces back together, so now we’re back in business. As we’ve made this transition, we’ve been reviewing the archived content of our sites. We’re surprised to find that it’s been nearly a year since we chronicled our experiment, Living on $42.00 per Week, shopping and dining within the Food Stamp budget. Having reviewed our experience, we thought it would be a good idea to reflect on where we’ve been and where we’re headed in the year to come. The stark answer is that we don’t know. The changes we’ve made in our lives since last year have more to do with energy conservation than diet. Given what has happened to the cost of fuel, and how that has affected virtually every other service and product we use, our thoughts have gone far beyond the inadequacies of the Food Stamp program. One of our friends, who runs a deli in Sarasota, says the Italian-American bakery delivering his fresh bread has raised the price three times since February. But the Publix 5-pound bag of unbleached flour had been the same price for a year—until a few weeks ago. That tells us that there weren’t too many other home bakers depleting existing shelf stock. However, a product requiring less time and manipulation than flour—dried pasta—has doubled in price. The retail prices of virtually all foods have risen over the course of the past year—most dramatically in the last four months. Eggs and milk have been climbing steadily and grain products have bolted. Crude oil gets a lot of press, but the increased volatility of food commodities make trading in rice, wheat, and corn qualify as an extreme sport. Canned goods have gone up, too, and we see far fewer specials. There doesn’t seem to be a 14 oz. tin of anything on offer for less than half a dollar. Where have those once-frequent two-for-one sales gone? Up at Bradenton’s Red Barn, our former haunt for produce, a week’s worth of fresh vegetables herbs, and fruit for two cooks like us now costs $14 – $16 per week. Last year, we usually spent $10 – $11. So we are shopping closer to home, buying more things from the Saturday morning market downtown—whether our purchases are the pricey organic items or “conventional” produce from the wholesale market in Tampa. If we factor in gas at $4 a gallon, we save the 25 mile round-trip to Bradenton and at least a gallon of gas by staying here in town. And we give up two things we really care about: the broader selection of Latin produce and the pleasure of eavesdropping on fellow shoppers chatting in Spanish, Portuguese, Arabic, and a host of Asian and Slavic languages. Gas, of course, is the big topic of conversation for everyone today—up a third from the price this time last year. We, the cheerful, resourceful foodies. have to admit: it casts a cloud over our daily lives. The Farm Bill—which contains amendments to the Food Stamp program—remains in limbo. Anticipated are: Congressional approval, Presidential veto, and ultimate override of the veto. How much the weekly Food Stamp allotment stood to increase—if at all—was never clear. But we stand firm on one thing: Food Stamps won’t alleviate American hunger and malnutrition unless education is a major component of the program. Rampant obesity among our poorest citizens demonstrates that knowing how to choose and prepare nutritionally and economically sensible meals is not an innate skill. Even for people as savvy as we consider ourselves to be, the grocery store can be a hornet’s nest of nutritional traps. Last week we bought a loaf of multi-grain whole wheat bread only to discover later, on tasting, that it was heavily sweetened. Why? High fructose corn syrup prolongs shelf life for all those centrally baked loaves trucked around the country. It’s not only wheat prices that are making your daily bread more costly. Oil runs farm equipment, the power plants that keep bread ovens baking, and the trucks that deliver the bread. We’re all caught in the same down-draft but we’d like to think we can help you cope as we and others rethink, adapt, and innovate. For starters, we’re using our pressure cooker a lot more now. 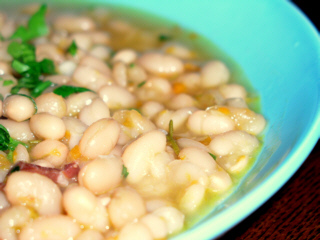 We’ve written about how easy—and energy-efficient—it is to cook beans. Of late, we’ve expanded our repertoire to include potatoes, yams, and beets. We’ve found them to be perfectly whole and cooked through with just five minutes under pressure. After that, we turn off the heat, not opening the cooker until at least an hour later (when the pot has cooled). And if you don’t open the lid and break the seal, the veggies can wait for more than a day, unrefrigerated, until you need them. As we’ve said, nutritional/culinary education is vital. A can of tuna, beyond serving as the base for the all-American tuna salad, can become Salad Niçoise, Provençal tuna salad; Condiglione, Italian tuna salad; Pain Bagnat, tuna grinder from the South of France; or Pasta with Tuna Sauce. This information is readily available on the Internet—from library computers if necessary—and in cookbooks from library shelves. And none of these dishes requires a can of cream of mushroom soup. Think about foods that can be multi-purpose. As we wrote last year, a take-out rotisserie chicken—although not eligible on the Food Stamp allotment—can be two, and possibly three, meals for two people. If you must snack, make it carrot sticks. Those zany “home economists” from a couple of generations ago certainly didn’t know half of what we know today about basic nutrition, but they had the right idea. While high fructose corn syrup may not be the nutritional demon it’s been made out to be, it remains insidious, unnecessary, and best avoided when possible. If we could impart only one piece of advice, it would be: Share your meals. Turn off the TV; don’t answer the phone.Whatever you bring to the table, sit down with the people you love. Make the time. From the moment we first heard about Congressmen giving up cocktail parties so they could stick to the Food Stamp diet, we asked ourselves if we could live on $42.00 worth of food each week. We knew the answer to be yes, but we decided to document the effort. Last week, we shopped and cooked as if we, too, had to get by on food stamps. Here in Florida, that means $21.00 per week for each eligible household member. Our household is comprised of two food writers who love to cook. We began our week-long experiment on Sunday, July 15, with $42.00 and the smugness of insiders. We ended our week on Saturday night with a steak on the grill and $5.46 remaining. Today, we’re talking about how we did it; whether we could sustain our enthusiasm if the dependency were real; and what we could have done better. As we studied the Web pages describing how others had attempted to meet “The Food Stamp Challenge,” we noted that many of the participants didn’t cook. They simply went to a grocery store and bought the cheapest food they could find. Recently the restaurant critic at one of Sarasota’s alternative newspapers did a feature on “The Food Stamp Challenge.” The author contrasted his own food choices with those of two young women with children, who really do receive food stamps. By his own admission, the critic’s synthesized experience was not a happy one. The women, who did not go into great detail about their meals, seemed to have worked our strategies for meeting their personal needs. We suspect that most of the public figures participating, unlike the food-stamp mothers, didn’t spend the sort of time we did thinking about how one would shop and prepare a week’s meals. Political office-holders have other agendas. Furthermore, we started our project with significant advantages over most who had attempted this challenge before us. • We’re foodies. We cook—from scratch, and we actually like grocery shopping and creating meals. For people like us, hunting for food bargains can be as much fun as yard sales and Ebay are for others. • We began the week with a well-stocked larder: among other staples, we already had our bargain-priced 3-litre bottle of extra virgin olive oil (e.g., we did not have to lug it home in a folding shopping cart in 92 F. heat nor did we have to drive to BJ’s to buy it.) Nevertheless, if we dipped into the pantry for something that made a significant contribution to our diet (the milk for our coffee, olive oil, bread we had frozen),we deducted its cost from our budget as if we had actually purchased it with our Food Stamp funds. • Because we own cars, we’ve no problem getting to the Vietnamese grocer on Fridays when he has fresh, whole kingfish. Or swinging into a Publix parking lot because it’s an easy right-hand turn and we just remembered their 2-for-1 special on canned garbanzo beans. 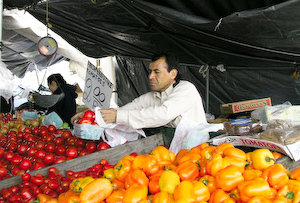 • We live an easy drive from an open-air produce market where we can buy more than a week’s worth of produce for approximately $11.00. So how was our week? Were we preoccupied with food? Absolutely, but then, because of our professions, we usually are. However we were not hungry between meals, and very satisfied as we made and consumed them. Certainly, we needed to be attentive to what we planned to eat and to whether or not we’d need to draw down our allotment. We cooked and sat down to eat two nourishing and delicious meals every day. We didn’t feel the need to snack, except for a few handfuls of sunflower seeds. We suffered no symptoms of fatigue or cabernet sauvignon withdrawal. Of course, wine isn’t eligible for the food stamp budget anyway, but it does soothe hunger. And although we often have wine with dinner, to play fair, we didn’t consume any during the challenge. To sum up, we did well, extremely well, and ate pretty much as we usually do. A nutritionist we know checked in during the week to tell us that she absolutely loved our food journal and intended to direct her entire mailing list to our blog. If she were more doctrinaire, she could have scolded us for not eating a “balanced” breakfast. But, if our mothers couldn’t do it when we were teenagers, we’re even less likely to start eating oatmeal or scrambled eggs now. We do eat those things—just not at the hour most folks do. In a typical week, we might have one or possibly two meals with meat as the focus. The key word here is might. Certainly the Sicilian member of this partnership feels that there is no such thing as too much pasta. And our culinary repertoire includes scores of dishes that pay our respects to the Holy Trinity of vegetarians everywhere—beans, greens and starch—be that rice, barley, bulgur, potatoes or pasta. We’ve gone days without more meat than an ounce of pancetta in some pasta alla carbonara. 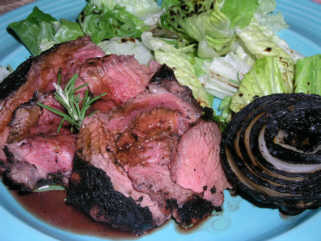 But when we do make meat the main event, it’s almost never a New York strip or loin lamb chops. We are big fans of lesser cuts over American favorites like rib-eye steaks and loin lamb chops. Our choices are not out of economic necessity nor because we have our grandmothers’ recipes for things like tripe, but because many inexpensive cuts of meat are, simply, the most flavorful. Short ribs and oxtail have been discovered by the foodie community, and their prices have risen. But beef cheeks are still a bargain. How weird can they be if Mario Batali is getting $23.00 per portion? As omnivores, we shop low and eat high. Nothing is off-limits, neither offal, nor meatless meals. One thing we felt we couldn’t do during the challenge was take full advantage of supermarket sales. This might be have been the hardest thing we faced all week: beef chuck shoulder steak was only $1.49 per pound at our local Sweetbay during the challenge. Ordinarily, at that price, we would have bought one steak for immediate use and a second to freeze. But as we thought we should keep some funds on reserve, we bought only one. Could we sustain the Food Stamp Challenge? Of course we could, but we’ve already confessed our own ‘unfair’ advantages. Eventually, we’d need to replace items depleted from our pantry. Even a small bottle of good olive oil could wreak havoc with a budget as austere as this. But if we were to really feel the pinch, we could eat more meatless meals, and it would be no hardship to eat more pasta. And since it is midsummer, we’ve barely dipped into the repertoire of hearty pulse and grain combinations that occupy our thoughts and table during cool weather. So was this week even a “challenge” for us? Not really. Does this mean we think the U.S. Government’s food stamp program is adequate? No way—but our reasons for claiming the deficiency have less to do with money than with education and eligibility. We’ll expand our ideas on this topic in a post within the next few days. Our thanks again to Derrick at Obsession With Food for mentioning us on his blog. We’d like to see more food bloggers take up the Food Stamp Challenge. We’d love to have the insights and recipes that come out of other bloggers’ kitchens during a week of living on the food stamp budget. Please let us know if you join the experiment. We’ll put a link to you on our blog. Before we eat anything substantial, we usually opt for caffeine and a few hours spent brainstorming and writing. (We’ve both resided in countries like Portugal and Italy, where breakfast may be only a beverage.) We buy good arabica (both whole beans and ground, in bargain quantities) and often add powdered cinnamon to the ground coffee. 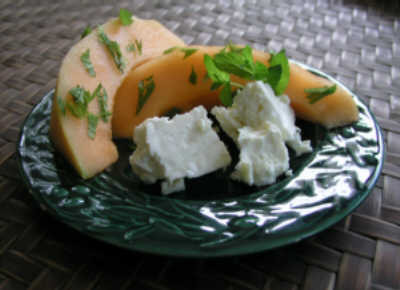 Around the Mediterranean, melon and cheese are often paired. Nowhere is the combination more refreshing than in Turkey, where one of us has lived. Today’s mid-day meal needed only some warmed whole wheat pita bread and snippets of fresh spearmint to enhance the half cantaloupe and 4 oz. chunk of feta* cheese we shared. * Feta is the Greek name for a soft, crumbly white cheese that may be made from cow’s and/or sheep’s milk. Popular throughout the Balkans and Middle East, it’s long been made throughout those regions. Now there are internationally marketed brands coming from Denmark, France, Britain, Canada, and the US, as well as the traditional producers like Greece and Turkey. Our favorite is Bulgarian, but in Sarasota, we’re happiest with the tangy American Président label ($2.99 lb. at BJ’s). Food Stamp Challenge aside, we rarely buy any bottled or canned soft drinks. But we do drink cold tea throughout the day. We vary our additives according to what we have around, but here’s our basic recipe. Place the tea and other ingredients in a large teapot. Bring 1 quart of water to a boil and pour it into the teapot. Stir pot to settle the tea. Let stand 4-5 minutes. Meanwhile, bring one more quart of water to a boil. Strain brewed tea (it will be very strong) into a 2-quart, heat-resistant vessel that will fit in your refrigerator. Refrigerate this half-full vessel. Leave all the ingredients in the teapot and refill it from the boiling kettle. Let this weaker tea sit until it has cooled slightly. Strain and add to the first batch. We usually reserve the ginger slices (which are still very flavorful) and put them into the cold tea vessel. Sweeten, if you must, but the aromatics may just pacify your sweet-tooth. Chill and enjoy with or without ice. We wanted our last meal to be special. The weather deities of south Florida had other ideas, but in the end, they relented enough to allow us to grill a steak. On our last foray to Sweetbay supermarket, we found beef chuck shoulder steak on sale at $1.49 per pound. While this cut of beef is not as inherently tender as New York strip or rib eye, it’s well marbled and flavorful, and much less costly: just the sort of cut that benefits from a long marinade. The boneless piece we brought home was destined for tagliata, an Italian steak salad. Tagliata means ‘cut,’ in reference to the method of serving this salad. Ordinarily, a steak is marinated, grilled, then sliced diagonally into strips, tossed with greens, and dressed with olive oil and lemon juice. The traditional leafy component for tagliata is arugula, a green that does not grow well in hot weather. We decided against a short drive to Whole Foods, where arugula is nearly always available (about $2. 50 a bunch). That would have pushed our budget limits. Furthermore, we have been trying to consume as much Florida-grown produce as possible, for this experiment and in ‘real life.’ To quote Cole Porter again, “It’s too darn hot.” Arugula and other bitter greens are surely growing in shade-houses somewhere right now, but under the July skies of Sarasota, no way. Watercress ($0.89 a bunch at our Vietnamese grocer, and a bit more at Sweetbay) would have been another good choice, but as we were in the middle of una tempesta, a downpour, driving anywhere wasn’t advisable. The most prudent choice seemed to be the heart of Romaine we had left from last week’s trip to the Red Barn. The classic marinade for tagliata is a simple mixture of olive oil, sliced garlic, and rosemary. Because we knew our shoulder would need some tenderizing, we added acid: 3/4 cup of yellow grapefruit juice. (We still have some over-ripe grapefruit clinging to the tree in our yard.) We let the meat marinate in the fridge for about four hours. At dinnertime, we grilled the steak (over palmetto again) until rare* and let it rest, covered, for approximately ten minutes. (As an accompaniment, we also grilled two halves of a sweet, white Florida onion.) We sliced the meat on the bias into 1/2 in. slices and served it over the Romaine, with an additional dressing of olive oil and balsamic vinegar . The last two ciabatta rolls rounded out this final feast. * Even at $1.49 per pound, we consider our steak to be an investment. As such, we wanted it to be as good as it could be. Though we hovered around the grill as it cooked, we wanted another edge. We used an instant-read thermometer to assure that we’d remove the steak from the grill when it reached an internal temperature of 120 F. We expected the temperature to rise an additional 5 degrees in carry-over cooking as the steak rested; an internal reading of 125 F. gave us a perfectly done, rare steak. In a couple of days, we’ll write a summary and assessment of our participation in the Food Stamp Challenge. With nearly $5.50 left over, we feel we’ve done very well. However, the real challenge lies ahead. How do we encourage actual food stamp recipients to look at our example and devise their own ways to prepare and share better meals with their families and friends.